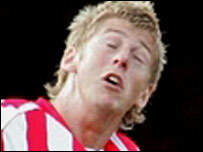 Derby have signed Sunderland striker Jon Stead on loan until the new year. The 23-year-old goes straight into the Rams squad for their trip to Plymouth on Sunday and will stay with the club until 2 January 2007. Stead has fallen out of favour at the Stadium of Light since the arrival of Roy Keane as manager in August. Keane said: "As much as I want to keep as many players as I can, if it looks like they are not going to get many games they should go out and play." Stead was a £1.8m signing from Blackburn in 2005 but has scored just twice in 40 appearances for the Black Cats. The arrivals of Dwight Yorke and David Connolly on transfer deadline day pushed him further down the pecking order. Derby boss Billy Davies is confident he can help resurrect Stead's career and wants to sign the striker on a permanent basis. "I feel we can help Jon become a better player and score the goals we all know he is capable of getting," he said. "Getting Jon here is not a short-term fix, I want him here on a permanent basis because I believe he will become a very good goalscorer."